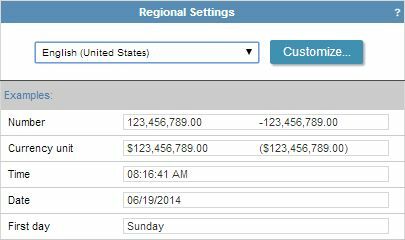 The regional settings allows to define monetary currency parameters, date and number formatting according to the region where the application is used. Click in customize to enter the values better suitable to the applications. The item Number define parameters like decimal symbol, negative format, and digits grouping. These are parameters applied in applications using decimal type field. Image2: Regional settings - Number parameters. In the Currency unit are available parameters like currency symbol, currency positive format among others. These parameters applied in applications using currency type field. Image3: Regional settings - Currency parameters. The items Date and Time define parameters applied in date and time formatting used in Date and Time, Time, and Date type fields. Image4: Regional settings - Time parameters. Image5: Regional settings - Date parameters.